Kids nutrition is difficult to teach if you don’t have a plan. With all the sugary foods out there, your kids (ours included) are probably wondering why they should even eat anything else. Lucky for you, we have a plan. 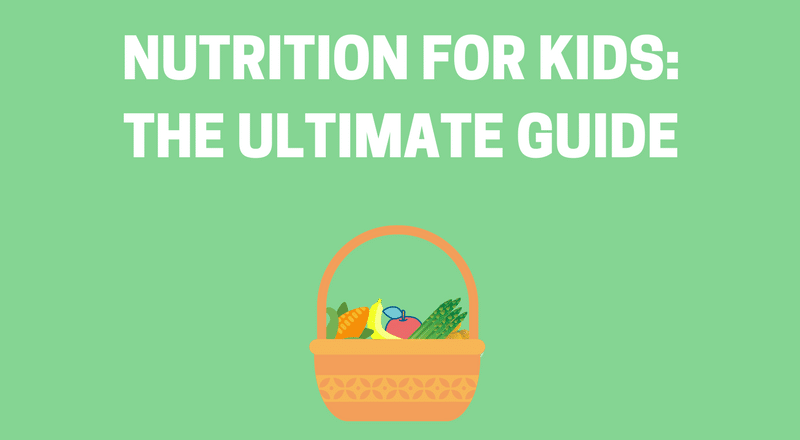 In our ultimate guide to children’s nutrition, we’ll show you how to teach your kids about nutrition and help create a foundation for a healthy life, step-by-step. We’ve even got a section that will show you how to find healthy foods for even the pickiest eaters (more on that later). You may think teaching your children about healthy eating isn’t important. They don’t listen to you anyway, right? Can’t they just learn about nutrition at school? However, teaching kids about the importance of nutrition from a young age is VERY important. Because it lays a solid foundation for a healthy lifestyle that will last for their entire life. That’s why it’s an excellent idea to reinforce the lessons your child is learning about nutrition at school AND at home. The first step to teaching your family about nutrition is familiarizing yourself with the specific nutritional needs of children. Although children and adults both need the same types of nutrients in their diets, the specific amounts of nutrients needed by children vary depending on their age. According to the Mayo Clinic, it is important to focus on including specific nutrient-rich foods in your children’s diet to encourage healthy development. Fortunately, the simple food pyramid for kids, also known as MyPlate, lays out healthy and nutritional eating for children in an easy–to–understand format. This modern take on the food pyramid is probably not the traditional pyramid that you are familiar with. 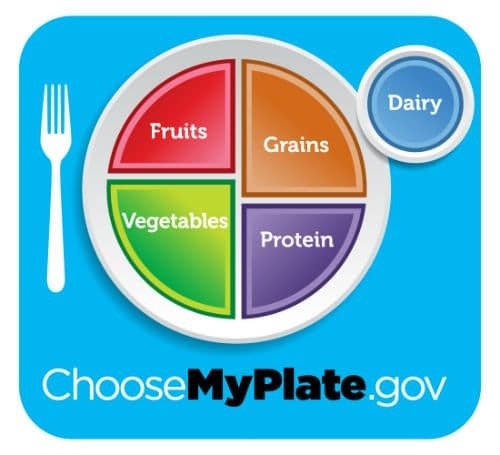 Instead, MyPlate takes an updated approach to the classic food pyramid and lays out essential food groups in a plate format. This plate includes the five key food groups needed for healthy childhood development — including proteins, fruits, vegetables, grains, and dairy. The layout of MyPlate’s modern food pyramid for kids nutrition makes it easy for parents and children alike to understand the amount of each food group that should be included in every meal thanks to the ratios presented on the plate visual. As you can see, this means focusing on vegetables and fruits as the majority of the meal, while limiting grains, protein, and dairy. When it comes to the types of foods you should aim to include from each food group we suggest following the below guidelines. For animal-based proteins, we suggest sticking to lean meats, seafood, poultry, and eggs. When it comes to plant-based proteins, nuts, seeds, beans, peas, and soy products are all excellent protein sources. When available choose fresh fruits of all kinds, such as apples, peaches, pears, kiwi, oranges, bananas, and melons. If out of season, try frozen, canned, and dried fruits. Avoid giving your child fruit juice, and if you do, opt for 100 percent juice. If giving your child dried fruit, avoid excess calories by remembering that a quarter cup of dried fruit is the equivalent of one cup of fresh fruit. Many vegetables are highly nutritious, such as squash, spinach, tomatoes, broccoli, onions, garlic and all green leafy vegetables. Even if the kids don’t like some of these, you can usually hide them in a casserole so they don’t realize what they’re eating. If you opt for frozen or canned veggies be sure to check for added sodium and choose the options with the lowest levels. Try to mostly stick to whole grains including whole wheat bread, cereals, brown rice, quinoa, oatmeal, and popcorn. Meanwhile, be sure to limit refined grains, which include white rice, pasta, and white bread. We suggest choosing low-fat or fat-free dairy products including yogurt, cheese, or fortified soy beverages for children that are lactose intolerant. Most children learn about the food pyramid in school, however, this teaching should be reinforced at home. You can do this by talking about how nutritious foods help strengthen our bodies and minds. You can also discuss how foods like cake, pie, candy, and sodas have no nutritional value and can lead to illnesses. Remind your kids often about eating right and ask them what they’ve had to eat today and how it fits into the food pyramid. Conversations like this can help the whole family become more aware of what they’re eating. One of the best ways to help your kids understand the importance of nutrition is to encourage them to help prepare their snacks and meals. The more time they spend with you mixing batter or rolling out dough, the more of a love they will develop for food. Let your kids touch the food and see what it feels like. Talk about how and where certain foods are grown and which foods are the most nutritious and why. Store-bought baked goods are packed with sugar and preservatives. When you bake at home, however, you have complete and total control over the ingredients that are going into your baked goods. Baking from scratch takes more time but is much healthier and will teach your kids to respect the amount of effort that is put into making delicious dishes. Check the nutrition label of all condiments, sauces, and other canned goods that you use. Without realizing it, you and your kids’ nutrition plan could be saturated with unwanted, added sugars. Like baked goods, try to make your own sauces and condiments. This will guarantee that your kid’s nutrition plan has an appropriate amount of sugar. Hydrate with water, not soda. It’s tempting to reach for a can of soda in the fridge when you’re thirsty, and kids may choose to imitate that behavior if they see their parents doing it. That is why leading by example is key to children’s nutrition. Be a good role model for your children by choosing water instead of sugary drinks, so they know that they can hydrate better with H2O. You can keep the fridge well-stocked with water bottles, or you can buy a filter for your sink to get clean, crisp water right from the tap. FBS Tip: Find out what motivates your child and use that to your advantage when teaching about hydration. We like to use sports to show that you can be much more hydrated and less prone to cramps and sluggishness when you choose water over soda. Limit processed sugars and foods. Anyone who watches TV at least a few hours a week has probably seen plenty of commercials for fast food, candy, soda, and other unhealthy processed foods. Kids are seeing those commercials along with adults, and they’re just as likely to want those foods — if not more. These items contain empty calories from their added sugars and fats, representing about 40% of daily calories for two to 18-year-olds. Around half of those empty calories come from drinks like soda, juice, and whole milk and foods including dairy desserts, grain desserts, and pizza. To help your kids get better nutrition, make sure that they eat plenty of fresh fruits and vegetables, along with lean meats, whole grains, and other healthy foods. Studies have shown that family dinner time can foster everything from a strong vocabulary to making healthy choices. When you eat dinner together, you get a chance for uninterrupted quality time, and you’ll teach your kids to eat more wholesome foods. Children like the routine of spending dinnertime together, and it’ll benefit your own well-being, too. You can forget the stresses of your day and enjoy being together — while encouraging healthy eating. Another key to nutrition for kids is learning how to pack healthy lunches that your kids will actually want to eat. We understand that it can be tricky to come up with new ideas and to figure out how to sub in healthy options for less nutritious school-lunch staples (like white bread and potato chips). Fortunately, we have learned a few tips and tricks for packing nutritious school lunches, over the years. An easy way to simplify packing healthy back to school lunches is to stick to a rotating lunch schedule! This not only keeps you from trying to throw together a nutritious lunch at the last-minute with whatever is left in your pantry, but it also offers your children a consistent schedule and allows them to look forward to the days when they know they will get to eat their favorite lunch options. Wellness Mama suggests developing a lineup of about 10 different go-to lunches to rotate through every two weeks. At Fitness by the Sea, we believe that giving children choices allows them to develop independence and a strong sense of self. When it comes to packing healthy back to school lunches, you have a great opportunity to give your children a chance to choose which foods they want to incorporate into their diet. Tanya Steel, the author of Real Food for Healthy Kids, suggests parents give kids two healthy choices. Taking this approach to children’s nutrition narrows down their options and ensures they feel that they are eating a lunch that they want to be eating when lunchtime rolls around at school. While packing healthy back to school lunches it is also important to consider what you are packing your kid’s lunches in! Instead of using disposable plastic baggies, paper bags and the plastic lunch boxes from your childhood, try out a stainless steel lunch box that has separate sections for each part of your child’s lunch. This is an environmentally-friendly option that will also save you money in the long-term since you won’t constantly be purchasing sandwich bags, plastic wrap, and other “traditional” items used for packing lunches. According to WebMD, when it comes to packing healthy lunches this school year it is important to keep in mind that “each lunch offers an opportunity to improve your child’s diet,” and we couldn’t agree more! WebMD suggests making healthy swaps to improve the nutritional value of your child’s lunch. For instance, instead of using white bread to make a sandwich, opt for a 100% whole grain bread, which is full of healthy fiber and rich in nutrients. Another suggested swap is sending your kids veggie chips instead of classic potato chips as a side. They will still get the crunch they crave, while also reducing calorie intake and increasing their vitamin intake! As you can see, a few easy changes are an easy way to boost your children’s nutrition. Most parents cringe at the thought of having a picky eater in the house. That’s because they can transform mealtime into a battleground if not carefully dealt with. Mealtime should be a pleasant experience where the family gathers to discuss their day. Allowing a picky eater to turn it into an event that centers around their eating habits disrupts your whole family. It can cause other children to become resentful that one child gets all the attention simply because they won’t eat their peas. If you have one or more kids who tend to be picky eaters, then there are some healthy ways to deal with their issues that won’t cause a war at every meal. When it comes to nutrition for kids, try not to focus on what your child will not eat. Instead, focus on what they will eat. If they like macaroni and cheese (and who doesn’t! ), then praise your child for eating all their mac and cheese. Children love to get praise and encouragement. Perhaps they will decide to eat a few peas as well, simply to get that positive comment from a parent. This happens all too often in families. One child who consistently refuses to eat their veggies commandeers mealtime and turns it into their own three-ring circus. When we allow children to have that much power, then we can begin to lose control of our home. Remember who you are. You are the parent. They are the child. Sometimes we adults get in a hurry and don’t really listen to what our kids are telling us. Maybe the reason your child won’t eat their broccoli is that it is only partially cooked and is difficult to chew. Peas, carrots and other veggies are the same way. If they aren’t cooked properly, they can be hard on the inside and not at all tasty. Now for the good stuff: snack ideas you can use to get your kids to eat healthy, nutrient-rich foods! We have found that developing an arsenal of healthy snacks that taste good is the key to nutrition for kids. All of these yummy (and easy!) recipes have been tested and kid-approved by our family, meaning that even the pickiest eaters will be begging for a second helping! Trying to get your kid to eat their veggies can be tricky. However, these crunchy cauliflower bites from Paging Fun Mums take the delightful crunch of chips and junk food that we all love, and makes it healthy! 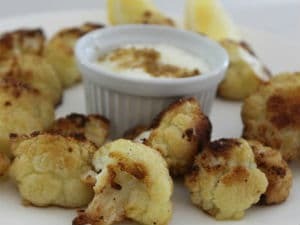 Ingredients: cauliflower, olive oil, salt and pepper. 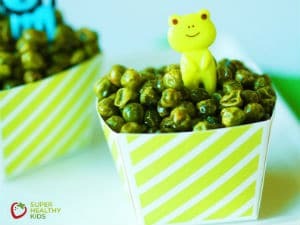 Another of our household’s snack-time favorites is these crunchy roasted green peas from Super Healthy Kids. The best part is, that you probably already have all of the ingredients on hand. A big batch of these tasty snack-sized bites is the perfect take-along snack for trips to the park or zoo. Ingredients: 1 bag of frozen peas, garlic salt, and olive oil. 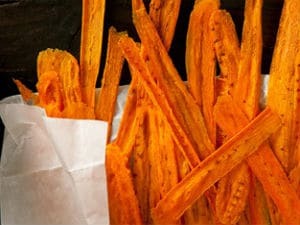 These carrot chips that we discovered on Hub Pages are another delicious way to incorporate veggies into your child’s diet. Similarly to the previous two recipes, these chips only require a few basic ingredients, which you probably have in your pantry. Ingredients: peeled, sliced carrots and salt. Another of our favorite recipes from the Super Healthy Kids website is this easy-to-make nut butter caramel dip. 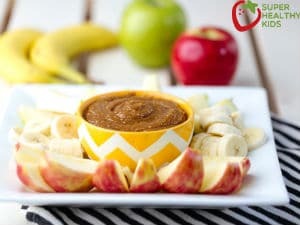 If you struggle to convince your kid to eat “an apple a day,” this protein-rich dip with a hint of sweetness should do the trick. Whip this up and you’ll never have a problem getting your kids to eat their daily serving of fruit again. FBS Tip: For those with nut allergies, simply substitute tahini or sunflower seed butter. Ingredients: peanut butter, milk, and coconut sugar. 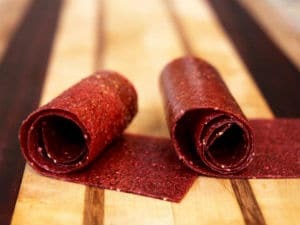 Satisfy your family’s cravings for sweets with these homemade fruit leathers. All you need is a food processor, an oven, strawberries and little bit of time. At only 15 calories apiece, with no artificial sweeteners, you can feel free to let your kids eat to their heart’s content. To add some variety to the recipe try subbing in bananas, raspberries, peaches or your favorite in-season fruit! Ingredients: strawberries or other in-season fruit. You don’t have to deprive your family of dessert to keep them healthy. 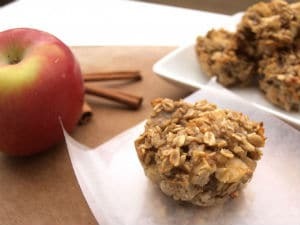 Nutritious dessert alternatives, like these apple cookies from Paleo Eats & Treats, will satisfy every sweet tooth in your life, while also providing a serving of fruit! 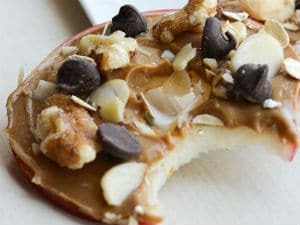 Ingredients: apple, nut butter of choice, walnuts, chocolate chips, and shredded coconut. 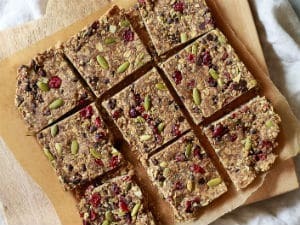 If your kids love store-bought granola bars that are packed with sugar and artificial flavors, try these superfood energy bars. The chewy and crunchy texture of these bars from over at the Yummy Mummy Kitchen blog will satisfy your children’s cravings for granola bars, while also being nutritious. Ingredients: rolled oats, flax meal, crunchy peanut butter, vanilla extract, maple syrup, pumpkin seeds, chocolate chips, dried cranberries, and salt. 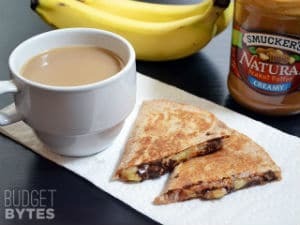 These budget-friendly peanut butter banana quesadillas are an easy and affordable dessert for your family! Being healthy doesn’t have to be expensive with these nutritious and delicious quesadillas. They are perfect for an after-school snack or a post-dinner treat. Ingredients: whole wheat tortillas, natural peanut butter, one medium banana and semi-sweet chocolate chips. Find the full recipe from Budget Bytes here. 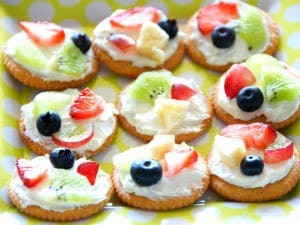 If your family loves to snack like ours does, these fruit and cracker pizzas from the Sunrise & Hurricanes blog will satisfy their hunger while giving them a nutritious serving of their favorite fruits. To assemble these simple “pizzas,” all you need is your favorite crackers, a cream cheese spread (or vegan alternative for those that are dairy-free) and the fruits of your choice. Ingredients: crackers, cream cheese spread (or vegan alternative), and the fruits of your choice. 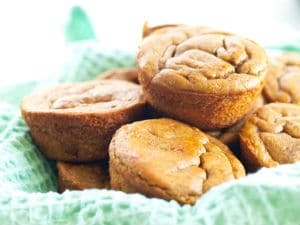 If your kids love fresh baked goods, but you can’t figure out how to make your favorite recipes healthy, these flourless sweet potato blender muffins are an easy and nutritious option to try! Just mix the ingredients up, pop them in the oven at 350 degrees for 15-20 minutes, and you will have a flourless treat everyone in the family will love. Ingredients: banana, sweet potato, egg, almond butter, pure maple syrup, cinnamon, ground ginger, allspice, nutmeg and baking powder. Find the full recipe from Super Healthy Kids here. Finding quick, healthy breakfast options that your kids will actually eat can be a difficult challenge. These apple cinnamon baked oatmeal cups are an easy and nutritious solution! Gluten-free, dairy-free, nut-free and soy-free, these oatmeal cups can be easily prepared the evening before and only include eight basic ingredients. Ingredients: old-fashioned oats, baking powder, salt, cinnamon, milk, eggs, bananas, and apples. Find the full recipe at Happy Healthy Mama here. We hope this post has provided you with the tools you need to help your child eat healthy, nutrient-rich foods. We walked you through how to talk to your kids about healthy foods all the way to providing 10 awesome snack ideas that will satisfy even the picky eaters. But, now it’s your turn. Take what you’ve learned about kids nutrition and help your child start on the path to living a happy, healthy life.